Sempang Airport (ICAO: WMKF) is an airport in Kuala Lumpur. 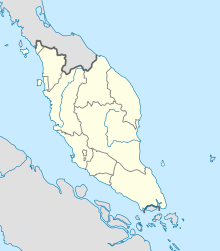 It is also known as TUDM Kuala Lumpur, Old Airport, Sungai Besi Airport or Sempang Air Force Base. It served as the main airport for Kuala Lumpur from 1952 to 1965 under the name Kuala Lumpur International Airport, until the main airport was moved to Subang International Airport. It was the first airport to serve Kuala Lumpur and currently remains as the only airport to be located within the boundaries of Kuala Lumpur Federal Territory. Formerly known as RAF Kuala Lumpur, today it is used by the Royal Malaysian Air Force (Malay: Tentera Udara DiRaja Malaysia), Royal Malaysian Police Air Wing, and the air unit of the Malaysian Fire and Rescue Department. The Royal Selangor Flying Club (Malay: Kelab Penerbangan Di-Raja Selangor) also flies from Sempang Airport. The four Cessna 172N Skyhawk aircraft belonging to the club are based at this airport. The airport was supposed to be demolished to make way for a housing estate, but that plan was cancelled and the airport is still used for air force flights. There had been non-fatal accidents before, involving single engine airplanes, at the surrounding roads and flyovers which are usually very busy during rush hours. The airport also housed the TUDM Museum, which was the only aviation museum in Malaysia but ceased operation for the construction of the Bandar Malaysia North station.. There was no entrance fee and there a total of 18 aircraft at the museum, including a de Havilland Tiger Moth and one of the few surviving Scottish Aviation Twin Pioneers. Some of the aircraft were accessible, like the de Havilland Dove. The airport has ceased operation on 16 March 2018.. The air base will be relocated to Sendayan which is 70KM away from Kuala Lumpur .